Brian Friel’s Translations is a play that works on money levels to portray Ireland under British rule – until a final confusing 20 minutes. On the interweb, as a companion to the legendary/controversial Crap Towns is the Crap Map of the British Isles. Highlights include Northern Scotland (marked at “Winter”), a group of Home Counties around Buckinghamshire (“Tories”), my own north-east England (“Rust”) and London (“Hipsters, Bankers and Riots”). The Republic of Ireland, however, is summarised quite concisely with “It’s Complicated” (and Northern Ireland gets “It’s Very Complicated”). 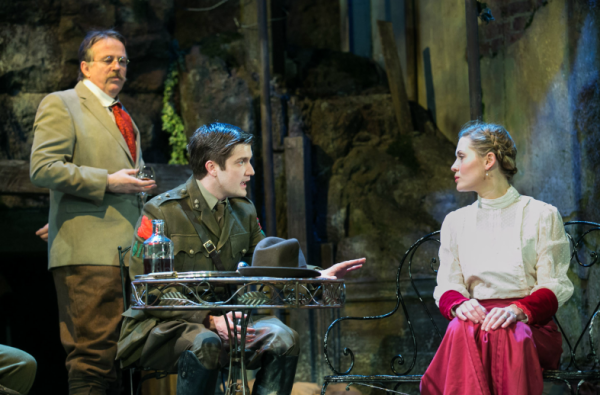 If, however, you want someone to expand on just how complicated it is, a good point of reference is Brian Friel’s classic play Translations, which toured to Northern Stage. I partly saw this as an apology to the Rose Theatre Kingston (who produced the play in partnership with English Touring Theatre), whose play I considered and rejected on my last London visit in favour of another play I bitterly regret choosing. But I’m glad I chose to see this one. 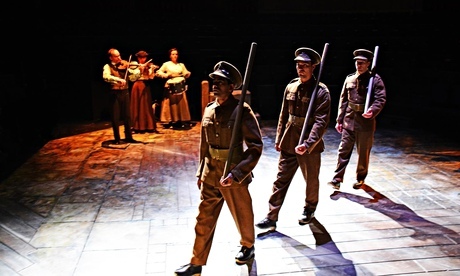 Even Sebastian Faulks thinks Birdsong is a tough novel to adapt for the stage. Rachel Wagstaffe’s adaptation, however, did the best possible job of it. One common misconception about playwriting is that adaptations is an easy way out. Someone else has done the difficult work with the creative side, one might think, and all you have to do is the technical task of transplanting it to the stage. On the contrary, it’s a fiendishly difficult job. There’s all sorts of pitfalls whether you are doing stage play to screen play, screen play to novel, novel to stage play, or anything the other way round. Amongst the challenges of a novel is the tough choice of what to put in and what to leave out – and anything more than 200 pages long will require huge cuts. And when you’re trying to adapt something as legendary as Sebastian Faulks’s acclaimed masterpiece Birdsong, you are trying to live to to impossibly high expectations. So when Rachel Wagstaff had a go at it, the story goes, Sebastian Faulks himself said it was “bonkers” to try. And yet here we are, just over three years on, and Birdsong is now touring as a highly successful production by the Original Theatre Company. Now, the cynics amongst you will be aware that it’s perfectly possible to have a commercial success, either on the West End or a film, with a poor adaptation that sells itself on the strength on the book it’s butchering. So to clear any nagging doubts, don’t worry: this is a damned good adaptation of story that was extremely tough to bring to the stage. 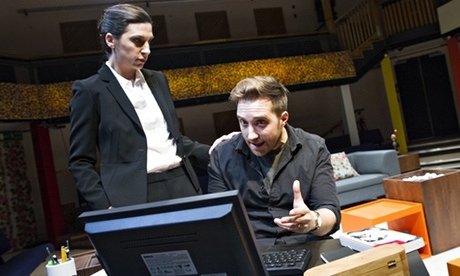 The Orange Tree Theatre’s It Just Stopped was a very promising idea for a play. Unfortunately, it was let down very badly by trying to be clever. So, here you are, a new thing for this blog: an outright negative review. As per my Reviews Policy, I normally save reviews for plays that are good, or at least have potential, but there are two times when I might give the thumbs down. One possibility is when a turkey is produced by a big-name theatre. I am patient with small-time companies and want them to learn from mistakes, but if it’s an abominable play produced by people who should know better, I reserve the right to give a good kicking. Stephen Sewell’s It Just Stopped is not one of those. Instead, it is the other kind of play that warrants a poor review: a play produced a competent company, with successes under its belt, that I think is going in the wrong direction. It is only fair that I start with good things about the play. I have no complaints about David Antrobus’s directing. All Orange Tree plays I’ve seen had great acting, and this is no exception. The set design was suitably interesting, especially the jelly-bean tiled wall (because that’s how homeowners designate themselves “quirky”). I must also point out I am at odds with Michael Billington on this one, who has praised the writer for not being afraid to take on lots of big issues on one play. Normally I would agree with this sentiment. But the more things you try to say in one play, the harder it gets. And this play went to the extreme, attempted to cover every issue under the sun, and ended up being incomprehensible on all of them. It’s a tried and tested show, you can’t go wrong if you’re a West End company, but Evita remains one of the best musicals out there. The West End is often bashed for formulaic commercial pickings, and Andrew Lloyd Webber – with a recent string of not-that-memorable shows and elimination TV appearances to his name – is often used as an easy target. His latest musical, Stephen Ward, is facing early closure after a disappointing run. So it’s easy to forget just how innovative he has been over the years. In, back in the 1960s, you’d have forecast that a man would write massively successful musicals involving people playing cats in leotard costumes, all-singing all-dancing Old Testament characters or roller-staking locomotives, you would have been laughed at – but that’s exactly what he did. Ranking alongside those musicals as his most innovative is Evita. At first glance, it is the story of the wife of famous/notorious Argentine president Juan Perón. Not far beneath the surface, however, is the story of what was going on in Argentina at the time. Can you make an interesting musical about Argentine politics? Yes you can. And the credit must, of course, be shared with Tim Rice for creating such a convincing world. Perhaps the most enduring asset of Evita is how relevant it has remained. It is over 35 years since the musical began, and 60 years since the Eva Perón era, but the things in the world that made the Peróns possible haven’t changed. Governments who rise by the coup who are doomed to fall by the coup. The irresistible appeal amongst a disenchanted working class of someone who used to be one of them. The strength of the masses, and the power one or two charismatic speakers can have to mobile them. Euphoria when an unpopular government is booted out by a new one promising better. Cold reality when it sinks in that the new regime isn’t much better than the old one. The way that some of the most impoverished and disenfranchised people in society idolise some of the richest and most powerful, as long as they look glamorous. The lengths politicians to go in order to meet expectations of glamour. It’s ironic that something that happened in the 1940s could just as easily happen today.